It is 4pm on the 26th of January and the team is back at the Condor’s Nest. This time we are nesting and moving in until we make our summit attempt. We have moved all of our supplies to this elevation of 18,300ft/5,578m. We are strong and our appetites are still good. 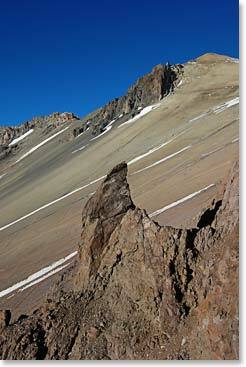 We are quite cozy considering that we are sitting on this high, exposed plateau with the summit of Aconcagua above us. The entire team climbed in great form today. We moved a bit slower today because we knew that we did not need to climb back down. We also have heavier loads since we’re moving in tonight. Winston, Howard, Paul, Lisa and Linda and Paule all climbed up very slowly which is important for acclimatization. They knew the terrain this time and still are very strong at this altitude. Of course, the Bolivian team is doing great. Perhaps we are talking too much about food, but it is amazing how much we look forward to meal time. When we returned to Plaza Canada yesterday afternoon, Maria had popcorn, cheese, Pringles, and cookies waiting for us as a snack. An hour later we had dinner and it was an even bigger hit than the tacos the night before. We had hamburgers with all the trimmings including fresh tomatoes. We had French fries too; it was quite a meal. Here we are settling into the nest, acclimatizing and preparing to climb higher. Tomorrow we will mostly rest at this altitude. 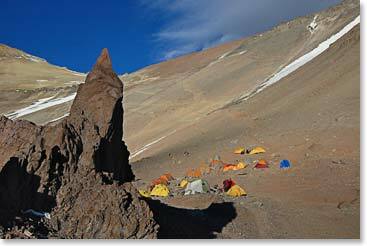 We may also hike a bit higher on the mountain, but we will return here to sleep for another night.